Nanopartz™ Nanorods™ were intratumorally given to mice bearing bilateral MDA-MB-435 tumors and imaged using X-ray CT to visualize three-dimensional distribution in tumors. A three-dimensional solid model of the complete geometry was rapidly reconstructed by image processing for use with computational photothermal modeling. Red, PEG-NRs. 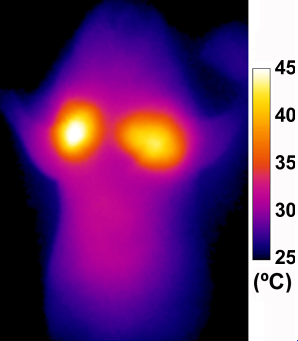 Experimental thermographic surveillance of NIR irradiation after X-ray CT (~0.75 W/cm2 , 1 min; bottom). From MIT/Nanopartz Collaboration 2009. Nanopartz™ Ntracker™ and Ntherapy™ nanorods for in vivo imaging are gold nanorods specifically for use in in vivo imaging applications such as cancer therapy research utilizing Two Photon Fluorescence, Optical Coherence Tomography, Photoacoustic Imaging, CT, Photothermal Imaging, and other imaging modeities. 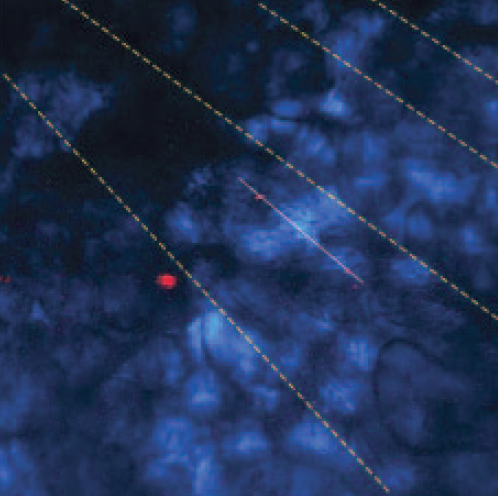 Ntracker™ nanorods are coated in a proprietary dense layer of hydrophilic polymers that shield the gold surface and give the particles ultra-long circulation times. Ntherapy™ nanorods come with similar hydrophilic polymers, but with terminal amine and carboxyl active groups, along with a number of custom popular in vivo targeting ligands. Ntherapy™ also provides an opportunity for the customer to define their own targeting ligands utilizing Nanopartz™ nanorod and polymer technologies. The combination of the highly monodisperse Nanopartz™ gold nanorods with the proprietary Nanopartz™ polymers increase circulation times 50% longer than other commercial polymers thereby significantly improving targeting. As opposed to other commercially available nanoparticles such as quantum dots, Nanopartz™ in vivo line of nanorods are completely non-toxic. Whereas Ntracker™ takes advantage of Enhanced Permeability and Retention effect (EPR) for passive in vivo targeting, Ntherapy™ utilizes popular ligands for active targeting. This product line comes in a diameter of 10nm with SPRs matching all of the popular Near IR CW laser wavelengths; 780, 808, 850, 980, and 1064nm. Ntherapy™ offers options for oligo and customer detailed conjugations. Every batch is radiation sterilized in PBS, and comes with instructions for in vivo mouse iv injection. A Certificate of Analysis (COA) is provided for every order exhibiting TEM and UV-VIS images and data, as well as DLS data. Every product is in stock (99%) and is shipped next day for many ligands. This product comes in two concentrations, regular 1.75mg/mL, and highly concentrated 10mg/mL. This product is available in 1mL and larger but in two different concentrations. The lower concentration is suited for mice, while the higher concentration is suitable for companion animals. For mice, the 1mL injection is suited for 5 injections. For orders larger than 100mL, or for orders amounting over 500mL per annum, please contact sales for quantity pricing. Photoacoustic Images are provided by our partner Visualsonics Inc.
OCT captures three-dimensional images from optical scattering media (e.g., biological tissue), and it sometimes can provide sub-micrometer resolution. However, the imaging depth in OCT is limited by optical scattering rather than absorption because scattering tends to attenuate and randomize the light. 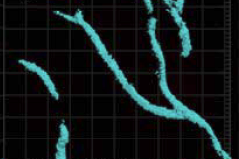 Depending on the wavelength of light, this technique can achieve imaging depths of up to 2 mm in most tissues. This technique has been used clinically for some applications such as eye examination and has been tested in vivo and ex vivo for cancer diagnosis. In order to generate sufficient contrast, the imaging agents for this modality need to have large scattering cross sections. 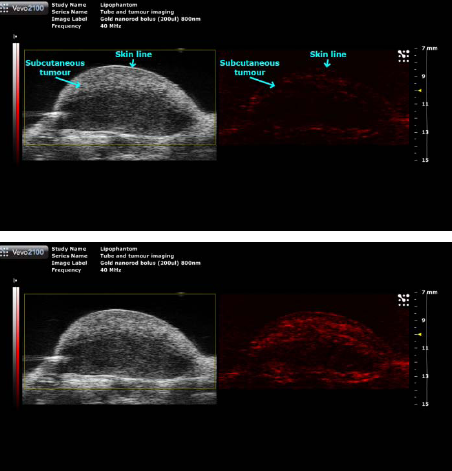 PAT is a hybrid imaging modality that provides strong optical absorption contrast and high ultrasonic resolution. Because the spatial resolution beyond one optical transport mean free path (~1 mm) is determined by ultrasonic parameters, the maximum imaging depth and resolution of PAT are scalable when diffusive photons are available. One can greatly increase the penetration depth of PAT with near-infrared light because the optical absorption of hemoglobin and scattering of tissues are weak in this regime. 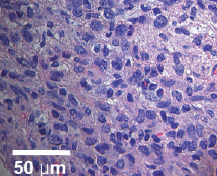 Therefore, a proper combination of PAT with the right contrast agent can accurately detect and diagnose tumors. As in the case of OCT, the imaging depth depends on the wavelength of light, but the imaging depth (~30 mm) is higher than OCT. 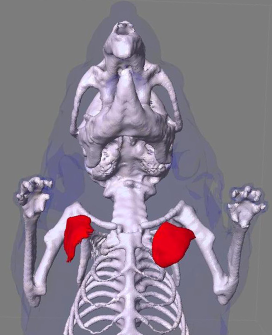 This modality is currently being evaluated in vivo. Additionally, contrast agents for PAT need to have large absorption cross sections. 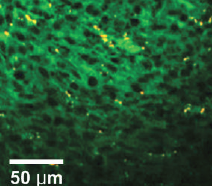 Two-photon microscopy is a fluorescence-based technique that offers images of living tissue up to ~1 mm in depth. 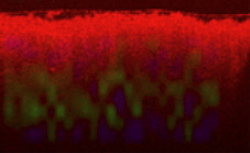 It usually uses red-shifted light to minimize scattering in the tissue, and the background signal is strongly suppressed owing to multiphoton absorption. It is being tested in vivo. 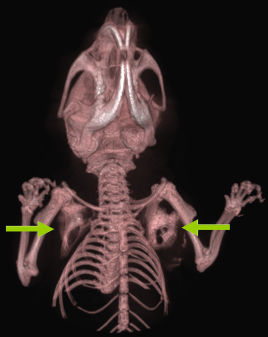 Recently, Nguyen and colleagues reported that surgery with molecular fluorescence imaging can be efficient for complete removal of tumors [http://www.ncbi.nlm.nih.gov/pubmed/20160097]. 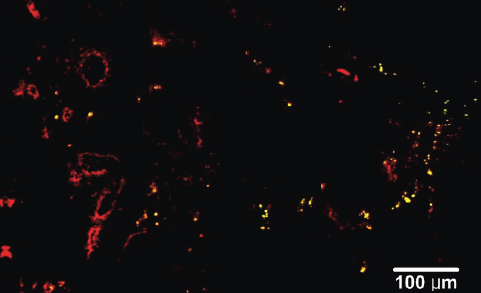 The results might suggest a breakthrough in the application of two-photon microscopy for molecular imaging to overcome the disadvantage of imaging depth. 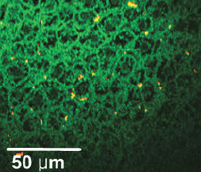 SERS utilizes the enhancement of Raman scattering by molecules adsorbed on surfaces of metal NPs. 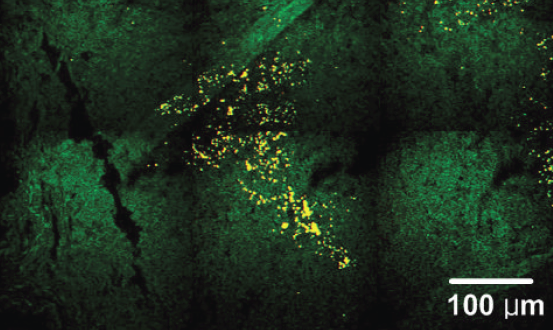 The increment can be as much as 10^14–10^15, hence Raman-active dyes placed on the surface of gold and silver colloids will exhibit greatly amplified Raman signals. 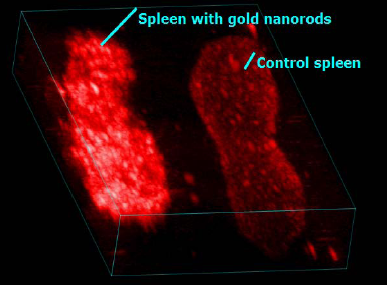 The ability of gold colloids to easily conjugate with targeting ligands enables the detection of tumors in vivo using this technique [http://www.ncbi.nlm.nih.gov/pubmed/18157119, http://www.ncbi.nlm.nih.gov/pubmed/19666578]. ... Water dispersed gold nano-rods (80 × 25 nm and 200 × 50 nm) were purchased from Nanopartz.